Here’s a new custom tenor ukulele made of salvage Koa from the Big Island. 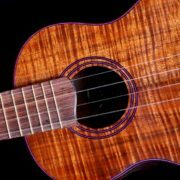 The Paua Abalone purfling combined with the darker Koa wood really pops. 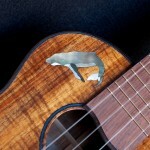 I think that these two components: Koa and Paua Abalone, especially dark Koa, are very complimentary. 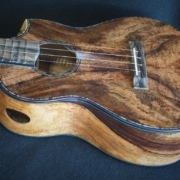 This Koa wood exhibits figure typically called “compression curl” and might be found in part of a tree where the limbs are curved or stressed into curvature or possibly closer to a fork in the tree. 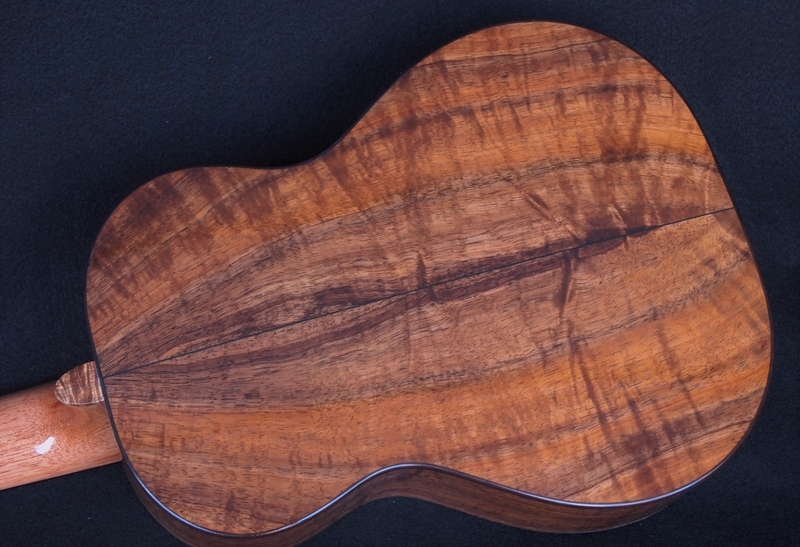 As an ukulele luthier, the biggest problem I find when using this particular type of wood is that it is difficult to saw into sets that book match as well as some of the straighter grained woods. 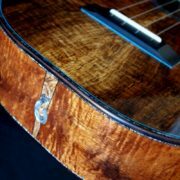 Nevertheless, having the exact same “look” with highly figured woods can become a little dull and boring–better, one-of-a-kind. 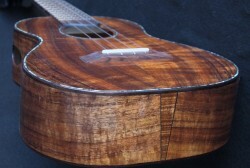 The accent wood is Koa from Kauai . I’ve used India Rosewood for the binding which also helps to accent the Paua Abalone purfling. 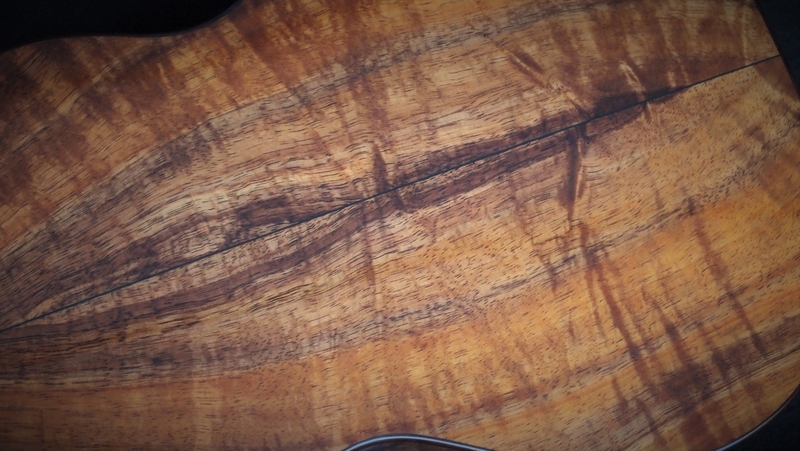 The Amazon Rosewood that I used for the bridge and fret board add a little more interest to the instrument without being a big detraction. 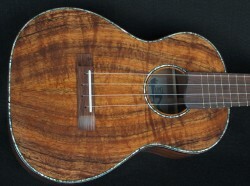 Good quality ebony is becoming increasing hard to obtain. 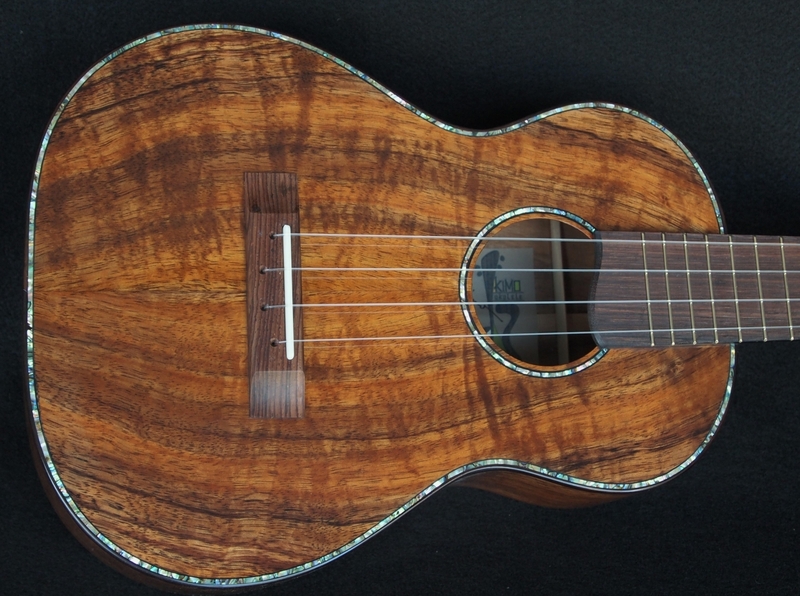 This rosewood has a very bright and focused “tap tone” that can only compliment the overall sound of the instrument. 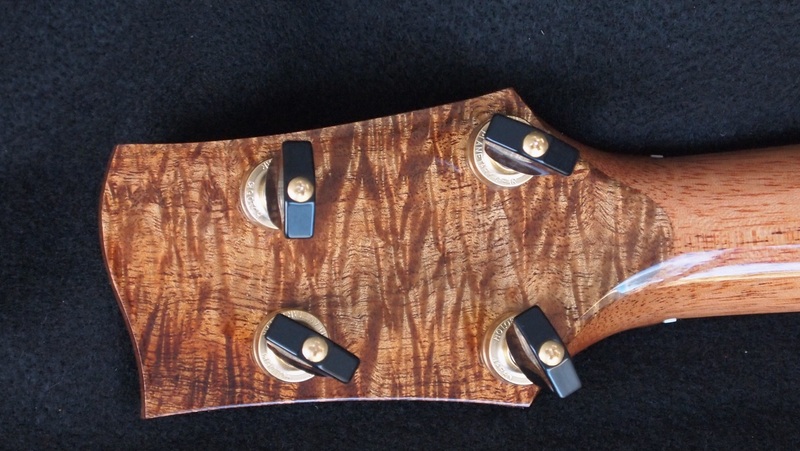 The neck is Honduran Mahogany. I’m not going to try and decipher the sound of the instrument with some of the colorful adjectives that are currently being bandied about. It really is getting to be somewhat comical when people are starting to describe “sound” the same way as Wine Spectator magazine describes the “taste” of wine. Really! 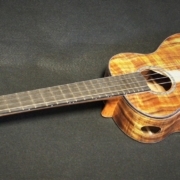 Of course this instrument does have that classic Koa sound: chocolate midrange, subtle raspberry overtones, lemony focus and trebles, not to mention a lingering, wonderful silky smooth, vanilla sustain. Watch out Wilfred, there’s a new kid in town!